Yesterday I took one guest for an evening drive. We saw a lot but the most interesting were baboons mating just after the Msine crossing. We watched them for a long time because they kept repeating every few minutes. Then at Sean’s cliff we saw Impala mating. 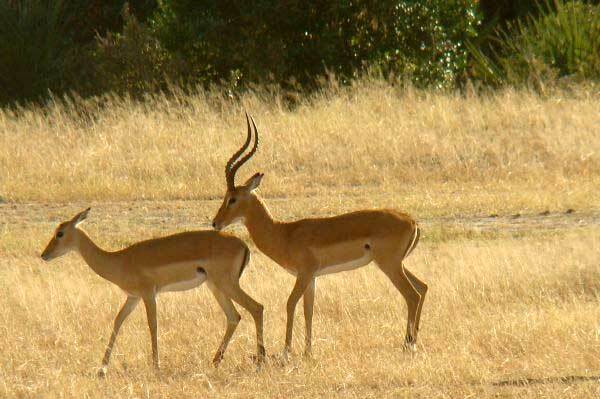 It is not the mating time of Impala now. Their mating time is between middle of March to April. May be she didn’t conceive. This morning I took two guests for a morning drive. It was one of the most fabulous mornings in terms of light and the animals. Just after the airstrip we saw a big herd of buffalo. There were about four hundred. One big bull started to mount one of the females. Before kill fish crossing we saw one bull elephant crossing the hill elegantly. After kill fish was amazing because we saw Impala, Baboon, Zebra, Wildebeest, Warthog and Giraffe grazing on one plain. Just after Tamlyn’s plain we saw an Impala shouting and looking at the bushes. We knew there was a predator around and we decided to follow the direction where the Impala was looking. We found one Lioness walking into the shade. 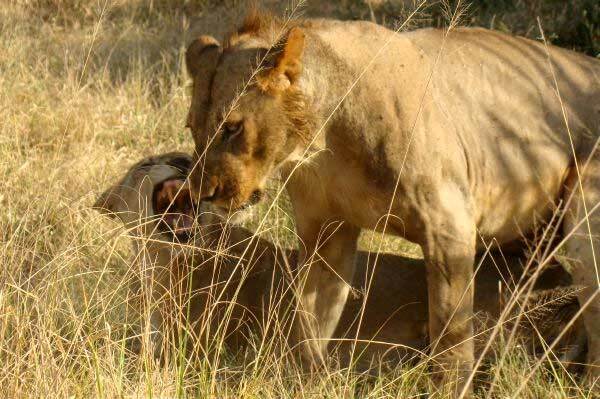 As we were watching her we heard a sound like Lions on honeymoon behind the bush. We went around for about ten meters and we found the honeymooners. We watched them performing two actions then we carried on with our successful drive. We had a lovely breakfast watching a family of Elephants, Impalas and Baboons at the Beho Beho palm forest just before little Serengeti. Little Serengeti as usual was full of nice game but what I love the most is we saw four different flocks of Ground hornbills. Then we went on the riverbed and we finish our drive with a herd of ten Elands and a beautiful bull of Elephant walked about six meters away from the car. So these two days have been the days of romance. This entry was posted in Salum, Wildlife and tagged Beho Beho, Beho Beho Safari Camp Selous, camp, elephant, lions, safari, salum. Bookmark the permalink.